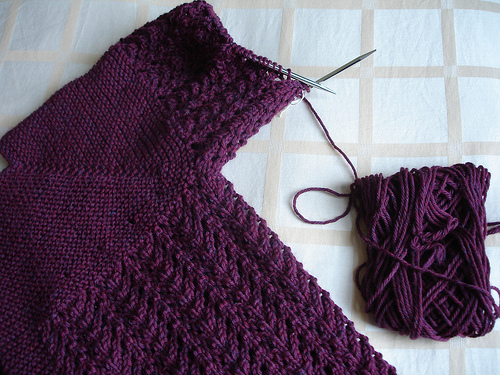 Picking up stitches is one of those things that almost all knitting patterns assume you already know how to do. Most of them will just say "Pick up N stitches" (where N is whatever number the pattern requires). I know that I was frustrated by this instruction when I was a beginning knitter, and I know that I am not alone in that! One common misperception is that there is a difference between "pick up and knit" and "pick up stitches." Many new knitters think that "pick up stitches" means that you stick your needle through the existing fabric, and that "pick up and knit" means that you stick your needle through the fabric AND make new loops. But this is not the case. Both of these phrases refer to the same thing: you stick your right-hand needle through the fabric, loop yarn around it, and pull it back through to create a new stitch. Another question is, exactly which part of the stitch are you supposed to stick your needle through? The "real" answer varies depending on a few factors, but I will tell you the truth: it doesn't really matter. AS LONG AS you are consistent! Choose which part you want to stick your needle through, and then be careful to always stick it through the same place for that particular project. The problem comes when you pick up just one stitch leg at a time for half of the length, and two stitch legs for the other half, and then maybe in between stitches here and there a few other times. This results in a wobbly, inconsistent line of picked up stitches which will look crappy no matter how hard you block it. My best tip for picking up stitches is this: go down a few needle sizes. If you are knitting on size 7s, use a size 5 needle to pick up your stitches. Then transfer the new stitches onto a size 7 needle and go about your business. The smaller needle size will make it easier to wrestle your needle through the fabric, and you will not notice a difference in gauge with that one line of stitches. If you know that you are going to be picking up stitches along an edge, you might want to prepare ahead of time by slipping the first stitch of every row. This gives you a line of double-height stitches, which are far easier to pick up than usual stitches. You can also knit the first and last stitch to get a garter stitch edge, which is also easier to pick up than plain stockinette.